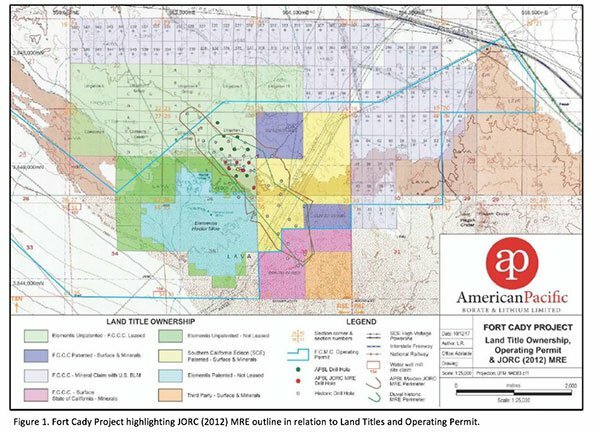 American Pacific Borate & Lithium (ASX:ABR) has announced its maiden JORC (2012) Compliant Mineral Resource Estimate for its 100%-owned lithium and borate Fort Cady Project in Southern California, USA. 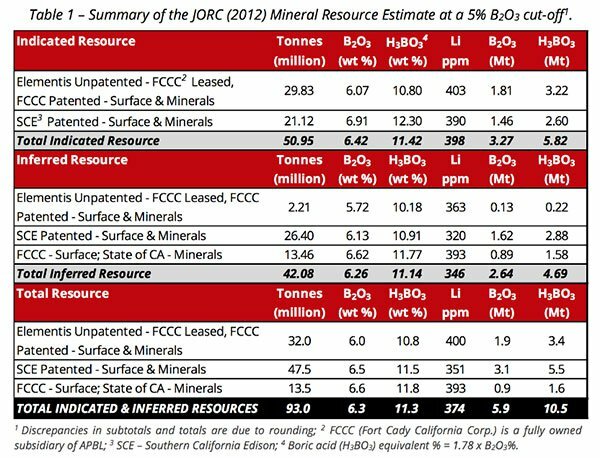 The Total Resource for Fort Cady is now 93.0 million metric tonnes at 6.3% B2O3 (11.3% Boric Acid equivalent1 [H3BO3]) and 374 parts-per-million Lithium (5% B2O3 cut-off) for 5.9 million tonnes contained B2O3 (10.5 million tonnes H3BO3). In total, Fort Cady has an Indicated Resource of 50.95 million tonnes at 6.42% B2O3 (11.42% H3BO3) and 398 ppm Lithium (5% B2O3 cut-off grade) for 3.27 million tonnes contained B2O3 (5.82 million tonnes H3BO3); and an Inferred Resource of 42.08 million tonnes at 6.26% B2O3 (11.14% H3BO3) and 346 ppm Lithium (5% B2O3 cut-off) for 2.64 million tonnes contained B2O3 (4.69 million tonnes H3BO3). The most significant results of all the above is the fact that ABR now has confirmation that it is sitting on a resource containing over 10 million tonnes of boric acid (H3B03). 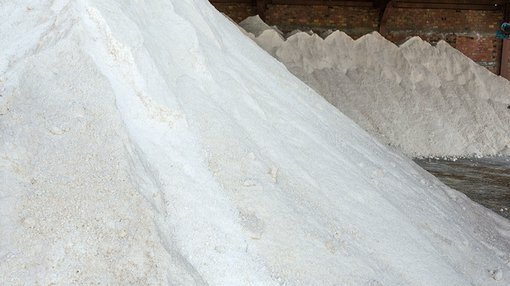 As Finfeed has reported previously, ABR’s main focus is its boric acid strategy. An initial testwork program indicated excellent boron recovery rates are possible, at relatively low temperatures and with modest acid consumption, for the boric acid mineralisation contained at Fort Cady. Promisingly, recent exploration has indicated that mineralisation at Fort Cady remains open to the southeast. 86 per cent of the total Estimate is contained within an Operating Permit region managed by ABR subsidiary, Fort Cady California Corp (FCCC) — which means the company is entitled to conduct commercial-scale mining of the deposit. It should be noted here that ABR is in the early stages here and investors should seek professional financial advice if considering this stock for their portfolio. ABR is also continuing its lithium exploration and extraction at the project, with the aim of identifying additional lithium resources outside of the defined borate resource. 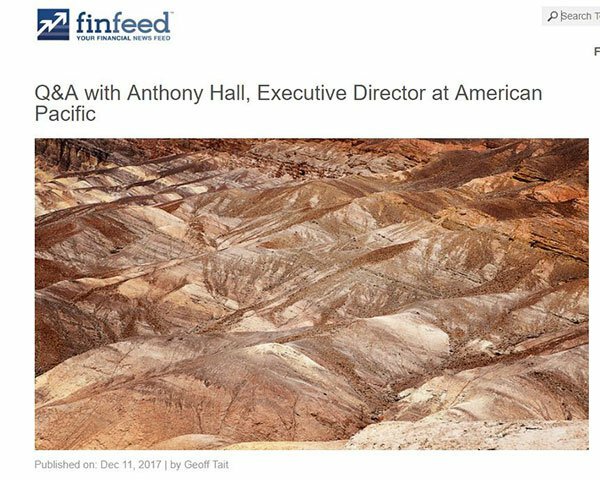 This is further explained in our recent Q&A with ABR Executive Director Anthony Hall. In relation to today’s announcement, ABR CEO Michael Schlumpberger said: “We are very pleased to release a JORC Maiden Resource containing more than 10 million tonnes of boric acid with upside that has been successfully delivered under five months since listing on the ASX. ABR will now look to complete its Scoping Study at Fort Cady by the end of CY2017, as well as complete further confirmatory Resource drilling to go towards a planned upgrade of its current JORC (2012) Estimate. At the same time, the company will look to complete its lithium brine drilling (with currently two of six holes completed) and continue its evaluation of the lithium potential at Fort Cady. All the above activity should ultimately help the company to advance towards an all-important Definitive Feasibility Study, with completion pegged for July 2018.